We departed on time from the Skidaway Institute of Oceanography dock at 0001 hours with 6 crew members, a compliment of 8 scientists and myself. The crew consists of Captain Raymond Sweatte, 1st Mate Michael Richter, Marine Technician John Bichy, 2nd Mate Kevin Holliday, Chief Engineer Richard Huguley, and Joel Formby. Though they have different titles, it became obvious from our discussions that their duties are often shared or overlap. 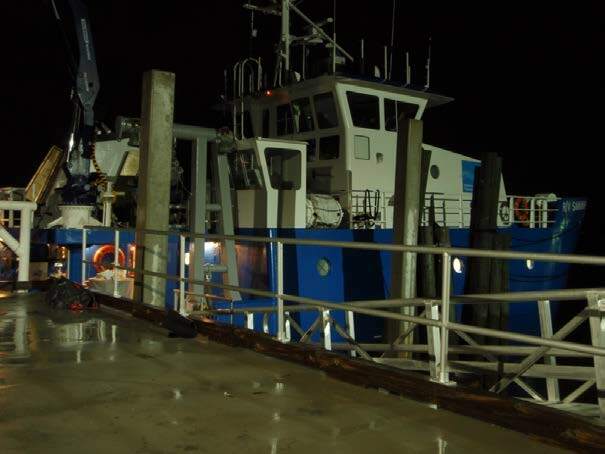 This arrangement is necessary because the R/V Savannah is functioning 24 hours per day. Because we are in transit to our first sampling site my interest has focused on the operators of the ship and how the ship functions. Capt. Sweatte outlined for me the steps in his career that have led him to being Captain of this vessel. Though military training is one avenue to prepare for a commercial captain’s license he did not follow that path. 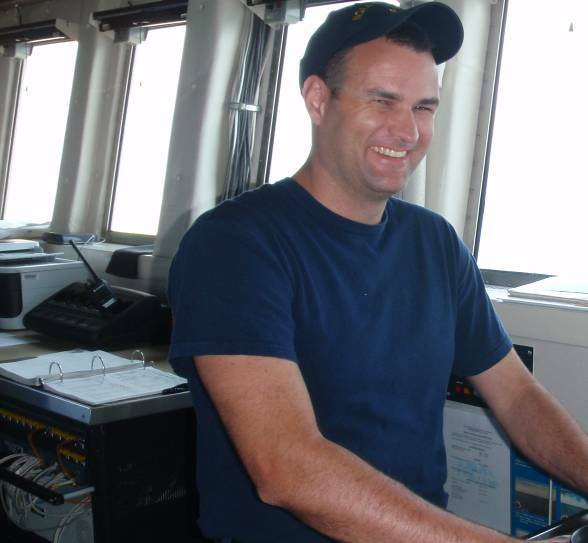 He worked his way up through various jobs as an able bodied seaman second mate, first mate, and finally the captain with 1600 ton vessel certification. His training is ongoing through “continuing education” programs in fire safety, sonar, survival training, and first aid. Chief engineer Richard Huguley gave me an interesting tour of the 4 compartments of the engine room. 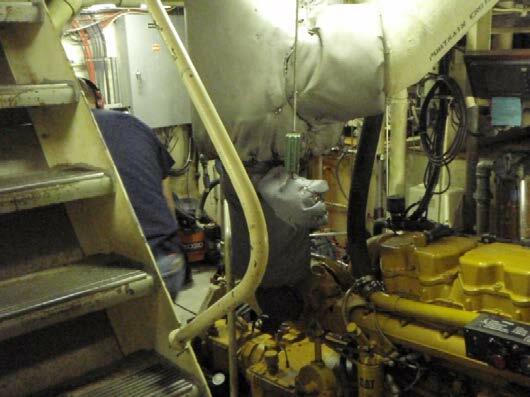 Water cooling systems, two 450 horse power Caterpillar brand engines, electrical and hydraulic system all have to be monitored and maintained during our cruise. Some systems are checked for pressure, temperature and fluid levels several times per day and around the clock. Engineer Richard Huguley had an interest in machines and an aptitude for mechanics at an early age. His skills have allowed him to have consistent employment in land based industrial enterprises and nautical work. My apprehensions about seasickness have been unfounded… thus far. I’m using a Transderm patch with scopolamine. It is difficult however to tease out the exact reason for my relatively calm stomach. Is it the chemical? Is it the relatively calm seas (4-5 ft. waves last night and 2-3 ft. waves today)? During the safety instructions last night a person was required to don the “survival suit” (also known as the “Gumby” suit). The attempt to don the suit quickly is always good for a laugh. Shelly, part of the science party, was our reluctant “volunteer” for the demonstration. Since we are in transit, there has been time to explore the ship, talk with science staff and crew, as well as enjoy the view of the Atlantic from the deck. Today I saw dolphins, barracuda, and flying fish, close to the ship and a submarine off in the distance. NOAA Teacher at Sea Margaret Stephens and Scientist David Hoke in Pisces attire. These scientists are not only smart, but they are neat and clean, too! After completing final mapping and fish sampling on the second-to-last day, we spent the remainder of the time cleaning the wet (fish) lab, packing all the instruments and equipment, and carefully labeling each item for transport. We hosed down all surfaces and used non-toxic cleaners to leave the stainless steel lab tables and instruments gleaming, ready for the next research project. 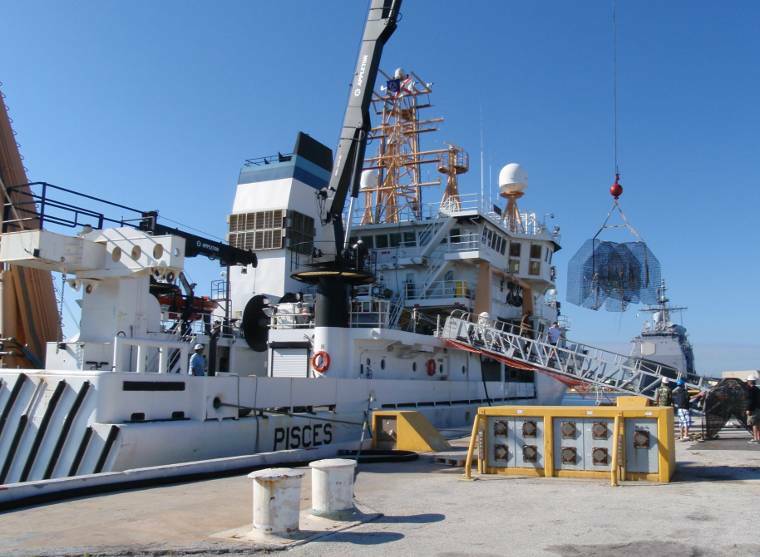 The Pisces, like other NOAA fisheries ships, is designed as a mobile lab platform that each research team adapts to conform to its particular needs. The lab facilities, major instruments and heavy equipment are permanent, but since research teams have different objectives and protocols, they bring aboard their own science personnel, specialized equipment, and consumable supplies. 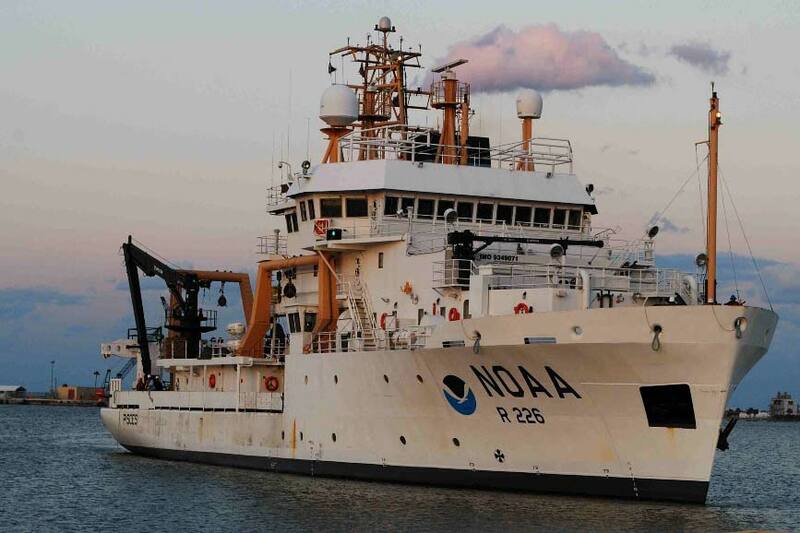 The primary mission of NOAA’s fisheries survey vessels, like Pisces, is to conduct scientific studies, so the ship’s officers and crew adjust and coordinate their operations to meet the requirements of each research project. The ship’s Operations Officer and the Chief Scientist communicate regularly, well before the project begins and throughout the time at sea, to facilitate planning and smooth conduct of the mission. We made up for the two days’ delay in our initial departure (caused by mechanical troubles and re-routing to stay clear of the Endeavor space shuttle launch, described in the May 18 log), thanks to nearly ideal sea conditions and the sheer hard work of the ship’s and science crews. 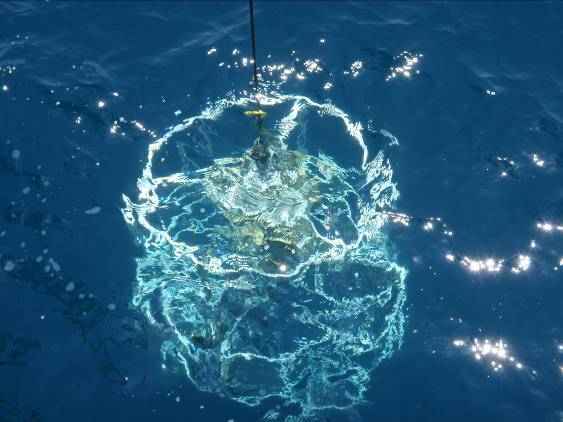 The painstaking work enabled the science team to fine tune their seafloor mapping equipment and protocols, set traps, and accumulate data on fish populations in this important commercial fishing area off the southeastern coast of the United States. 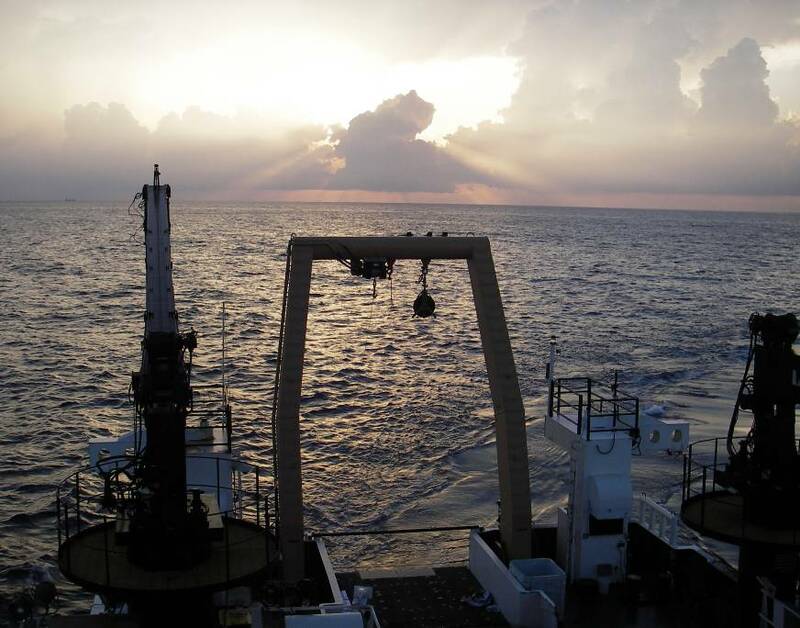 The acoustics team toiled every night to conduct survey mapping and produce three dimensional images of the sea floor. They met before sunrise each morning with Chief Scientist Nate Bacheler to plan the daytime fish survey routes, and the fish lab team collected two to three sets of six traps every day. The videographers worked long hours, backing up data and adjusting the camera arrays so that excellent footage was obtained. In all, we obtained ten days’ worth of samples, brought in a substantial number of target species, red snapper and grouper, recorded hours of underwater video, and collected tissue and otolith samples for follow-up analysis back at the labs on land. Scientists and engineers often use models to help visualize, represent, or test phenomena they are studying. Models are especially helpful when it is too risky, logistically difficult, or expensive to conduct extensive work under “live” or real-time conditions. 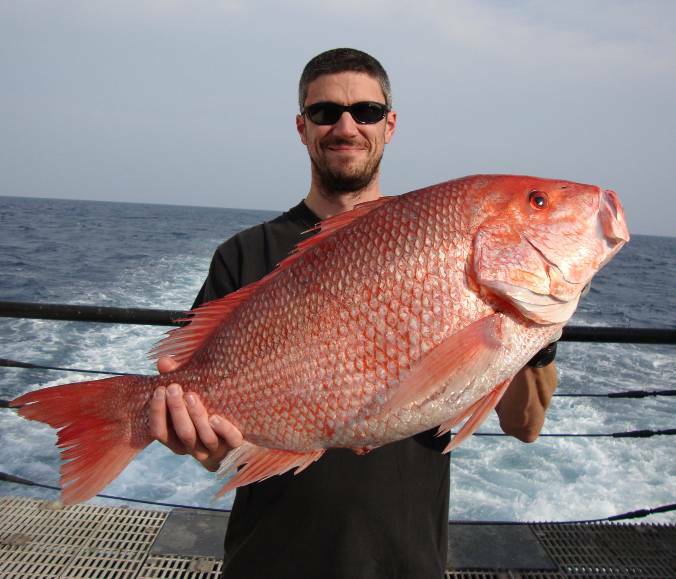 As described in previous logs, this fisheries work aboard Pisces involves surveying and trapping fish to analyze population changes among commercially valuable species, principally red snapper and grouper, which tend to aggregate in particular types of hardbottom habitats. Hardbottom, in contrast to sandy, flat areas, consists of rocky ledges, coral, or artificial reef structures, all hard substrates. 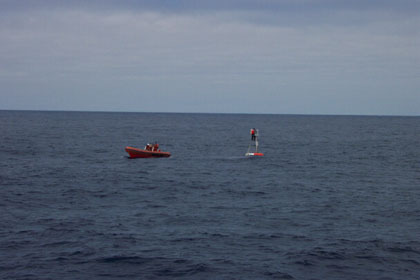 By locating hardbottom areas on the sea floor, scientists can focus their trapping efforts in places most likely to yield samples of the target fish species, thus conserving valuable time and resources. So, part of the challenge is finding efficient ways to locate hardbottom. That’s where models can be helpful. The scientific models rely on information known about the relationships between marine biodiversity and habitat types, because the varieties and distribution of marine life found in an area are related to the type of physical features present. Not surprisingly, this kind of connection often holds true in terrestrial (land) environments, too. For example, since water-conserving succulents and cacti are generally found in dry, desert areas, aerial or satellite images of land masses showing dry environments can serve as proxies to identify areas where those types of plants would be prevalent. In contrast, one would expect to find very different types of plant and animal life in wetter areas with richer soils. Traditional methods used to map hardbottom and identify fish habitat include direct sampling by towing underwater video cameras, sonar, aerial photography, satellite imaging, using remotely operating vehicles (ROV’s), or even setting many traps in extensive areas. While they have some advantages, all those methods are labor and time-intensive and expensive, and are therefore impractical for mapping extensive areas. 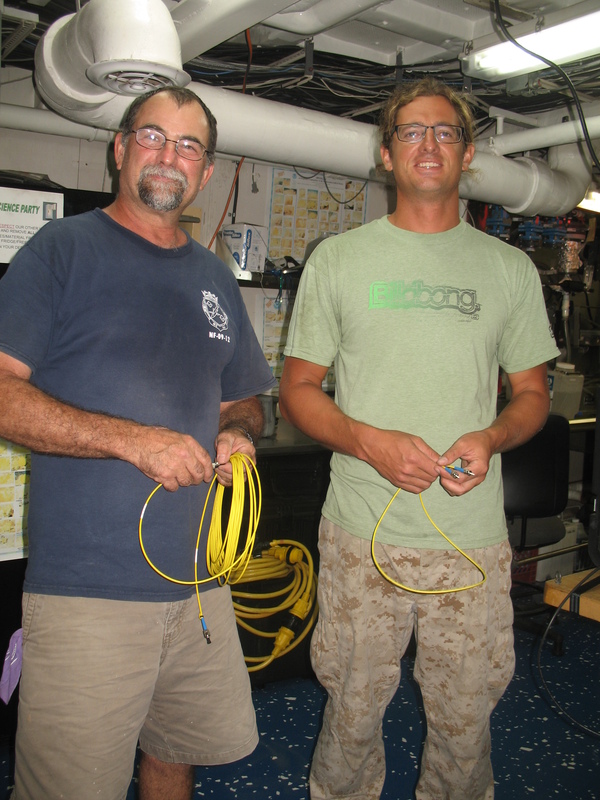 This Pisces team has made use of a computer and statistical model developed by other scientists that incorporates information from previous mapping (bathymetry) work to predict where hardbottom habitat is likely to be found. The Pisces scientists have employed the “Dunn” model to predict potential hardbottom areas likely to attract fish populations, and then they have conducted more detailed mapping of the areas highlighted by the model. (That has been the principal job of the overnight acoustics team.) Using those more refined maps, the day work has involved trapping and recording video to determine if fish are, indeed, found in the locations predicted. By testing the model repeatedly, scientists can refine it further. 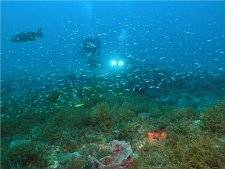 To the extent that the model proves accurate, it can guide future work, making use of known physical characteristics of the sea floor to identify more areas where fish aggregate, and helping scientists study large areas and develop improved methods for conservation and management of marine resources. 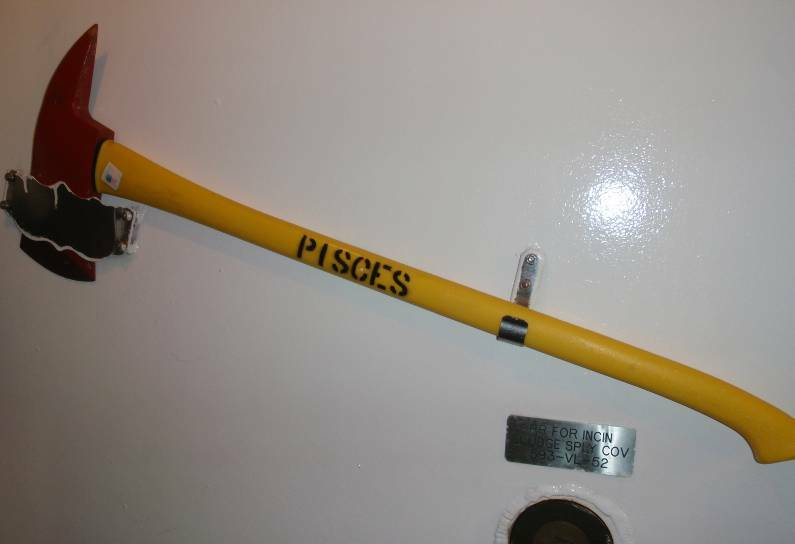 Another aspect of the data collection aboard Pisces involves measuring key physical properties of seawater, including temperature and salinity (saltiness, or concentration of salts) at various depths using a Conductivity, Temperature and Depth (CTD) device. 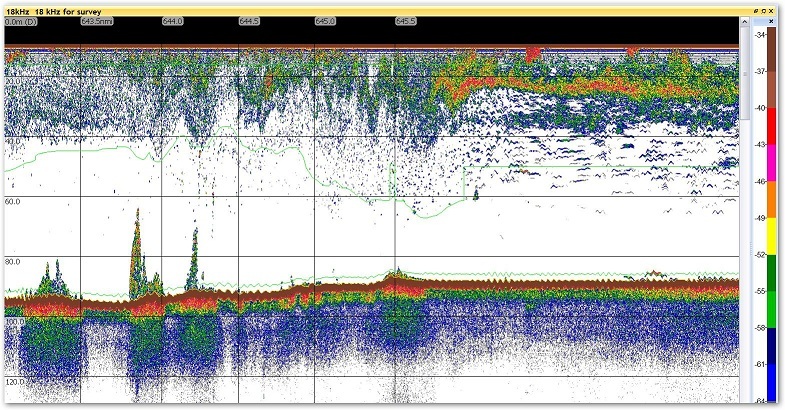 Salinity and temperature affect how sound travels in water; therefore, CTD data can be used to help calibrate the sonar equipment used to map the sea floor. In other instances, the data are used to help scientists study changes in sea conditions that may affect climate. 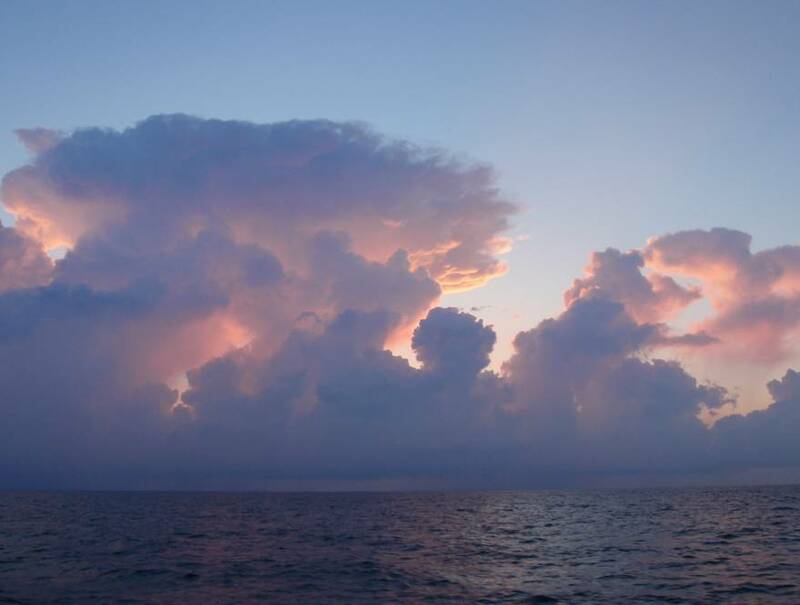 Increases in sea surface temperatures, for example, can speed evaporation, moisture and heat transfer to the atmosphere, feeding or intensifying storm systems such as hurricanes and cyclones. Pisces’ shipboard CTD, containing a set of probes attached to a cylindrical housing, is lowered from the side deck to a specified depth. A remote controller closes the water collection bottles at the desired place in the water column to extract samples, and the CTD takes the physical measurements in real time. 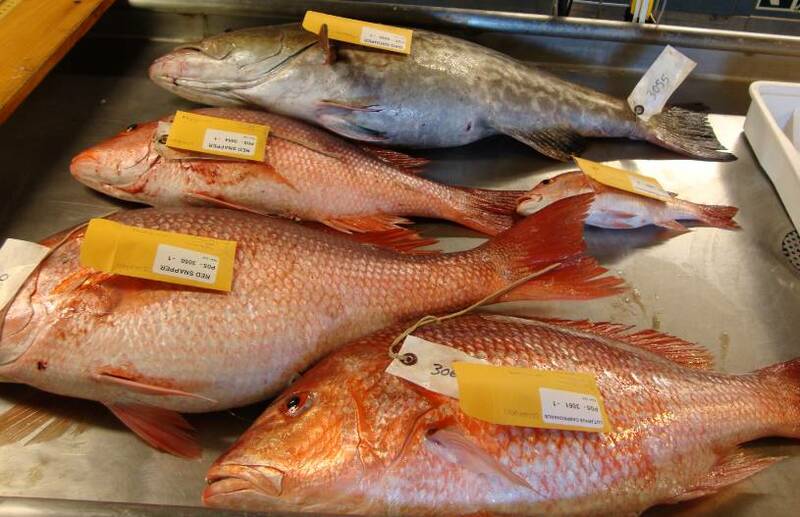 Of all the many species collected, only the red snapper and grouper specimens were kept for further study; most of the other fish were released after they were weighed and measured. 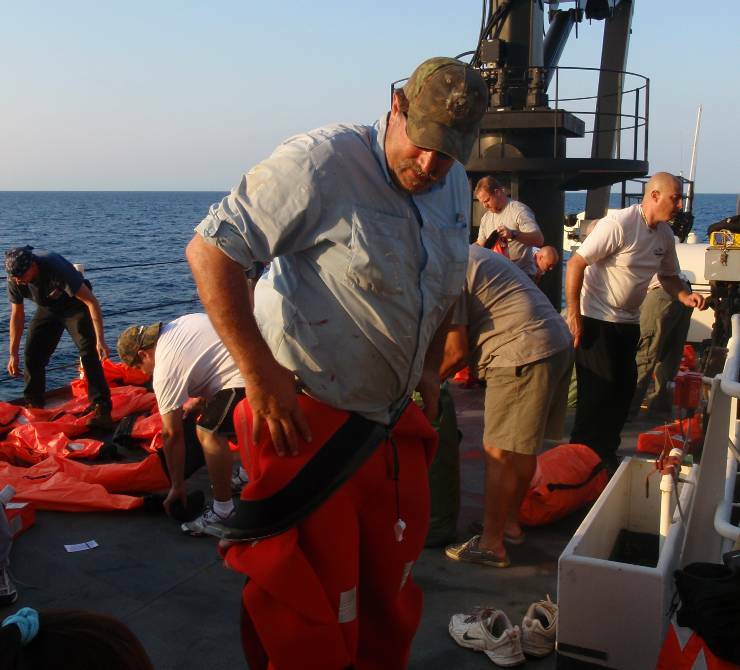 A small quantity was set aside for Chief Steward Jesse Stiggens to prepare for the all the ship’s occupants to enjoy, but the bulk of the catch was saved for charitable purposes. The fish (“wet” lab) team worked well into overtime hours each night to fillet the catch and package it for donation. They cut, wrapped, labeled and fresh froze each fillet as carefully as any gourmet fish vendor would. 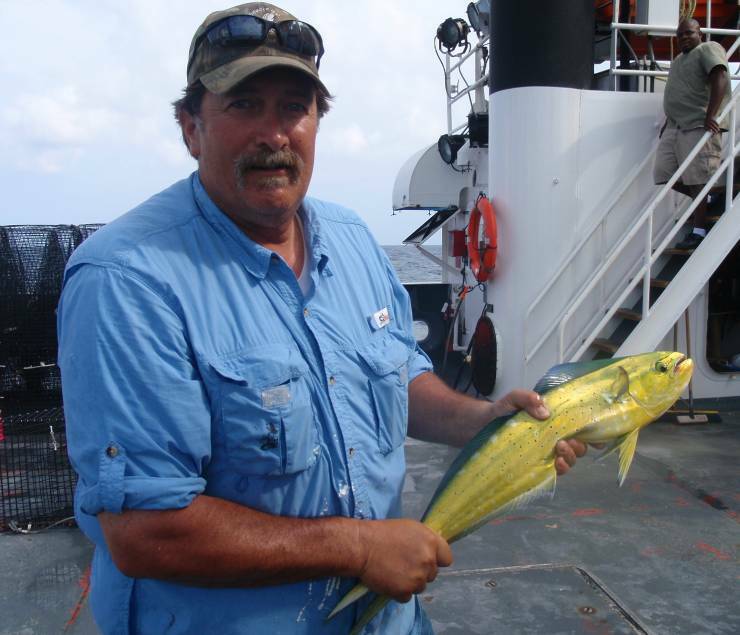 Once we disembarked on the last day, Scientist Warren Mitchell, who had made all the arrangements, delivered over one hundred pounds of fresh frozen fish to a local food bank, Second Harvest of Northern Florida. It was heartening to know that local people would benefit from this high-quality, tasty protein. Many crew members gave generously of their time to share with me their experiences as mariners and how they embarked upon and developed their careers. I found out about many, many career paths for women and men who are drawn to the special life at sea. Ship’s officers, deck crew, mechanics, electricians, computer systems specialists, chefs and scientists are among the many possibilities. Chief Steward Jesse Stiggens worked as a cook in the U.S. Navy and as a chef in private restaurants before starting work with NOAA. He truly loves cooking, managing all the inventory, storage and food preparation in order to meet the needs and preferences of nearly forty people, three meals a day, every day. He even cooks for family and friends during his “off” time! Electronics specialist Bob Carter, also a Navy veteran, is responsible for the operations and security of all the computer-based equipment on board. He designed and set up the ship’s network and continually expands his skills and certifications by taking online courses. He relishes the challenges, responsibilities and autonomy that come along with protecting the integrity of the computer systems aboard ship. First Engineer Brent Jones has worked for many years in the commercial and government sectors, maintaining engines, refrigeration, water and waste management, and environmental control systems. He gave me a guided tour of the innards of Pisces, including four huge engines, heating and air conditioning units, thrusters and rudders, hoists and lifts, fresh water condenser and ionizers, trash incinerator, and fire and safety equipment. The engineering department is responsible for making sure everything operates safely, all day and night, every day. Brent and the other engineers are constantly learning, updating and sharpening their skills by taking specialized courses throughout their careers. 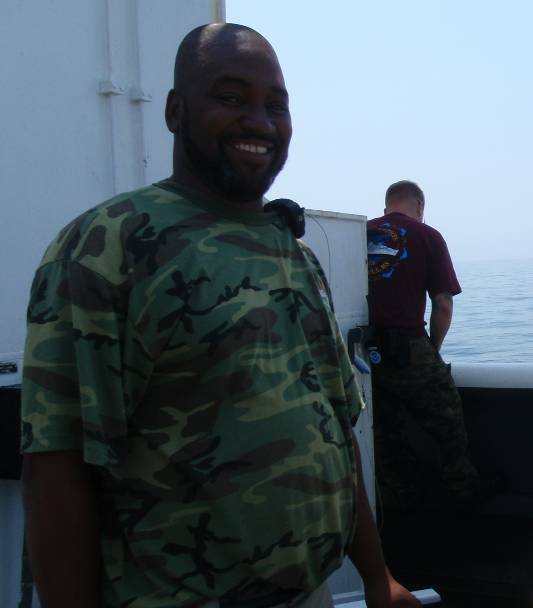 Chief Boatswain James Walker is responsible for safe, efficient operations on deck, including training and supervising all members of the deck crew. 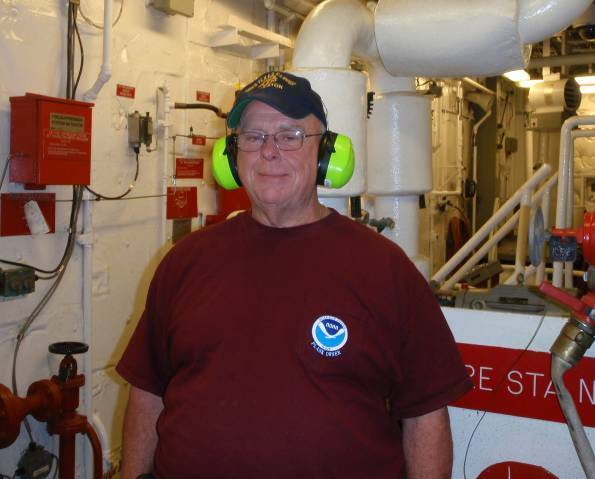 He entered NOAA after a career in the U.S. Navy. The Chief Boatswain must be diplomatic, gentle but firm, and a good communicator and people manager. He coordinates safe deck operations with the ship’s officers, crew, and scientific party and guests. 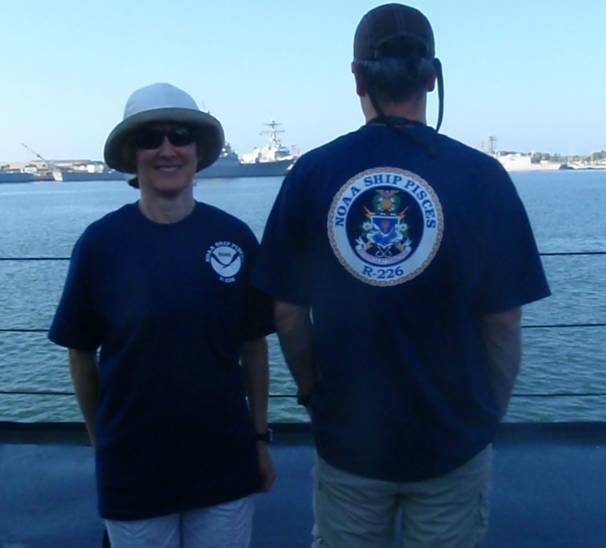 NOAA officers are a special breed. 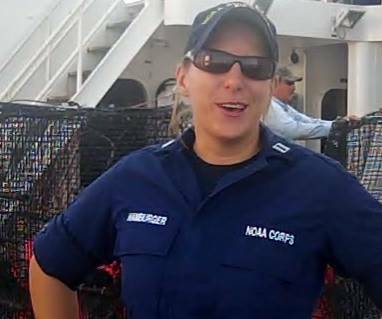 To enter the NOAA Commissioned Officer Corps, applicants must have completed a bachelor’s degree with extensive coursework in mathematics or sciences. They need not have experience at sea, although many do. They undergo an intensive officers’ training program at a marine academy before beginning shipboard work as junior officers, where they train under more experienced officers to learn ship’s systems and operations, protocols, navigation, safety, personnel management, budgeting and administrative details. After years of hard work and satisfactory performance, NOAA officers may advance through the ranks and eventually take command of a ship. All the officers and crew aboard Pisces seem to truly enjoy the challenges, variety of experiences and camaraderie of life at sea. 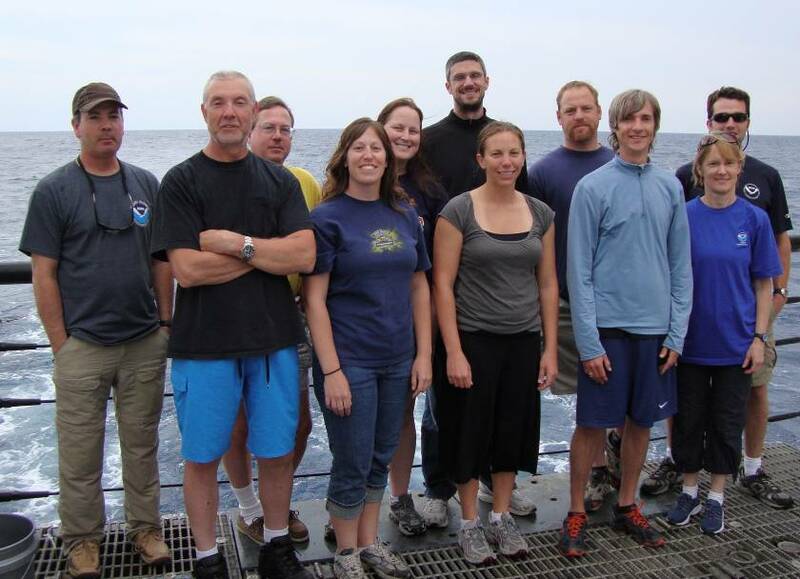 They are dedicated to NOAA’s mission and take pride in the scientific and ship operations work. To be successful and satisfied with this life, one needs an understanding family and friends, as crew can be away at sea up to 260 days a year, for two to four weeks at a time. There are few personal expenses while at sea, since room and board are provided, so prudent mariners can accumulate savings. There are sacrifices, as long periods away can mean missing important events at home. But there are some benefits: As one crewman told me, every visit home is like another honeymoon! I had expected that life aboard Pisces would include marine toilets and salt water showers with limited fresh water just for rinsing off. I was surprised to find regular water-conserving flush toilets and fresh water showers. Still, the supply of fresh water is limited, as all of it is produced from a condensation system using heat from the engines. During our ship orientation and safety session on the first day, Operations Officer Tracy Hamburger and Officer Mike Doig cautioned us to conserve water. They explained (but did not demonstrate!) a “Navy” shower, which involves turning the water on just long enough to get wet, off while soaping up, and on again for a quick rinse. It is quite efficient – more of us should adopt the practice on land. Who really needs twenty minute showers with fully potable water, especially when more than one billion people on our “water planet” lack safe drinking water and basic sanitation? The drill I had anticipated since the first pre-departure NOAA Teacher at Sea instructions arrived in my inbox finally happened. I had just emerged from a refreshing “Navy” shower at the end of a fishy day when the ship’s horn blasted, signaling “Abandon ship!” We’d have to don survival suits immediately to be ready to float on our own in the sea for an indefinite time. Fortunately, I had finished dressing seconds before the alarm sounded. 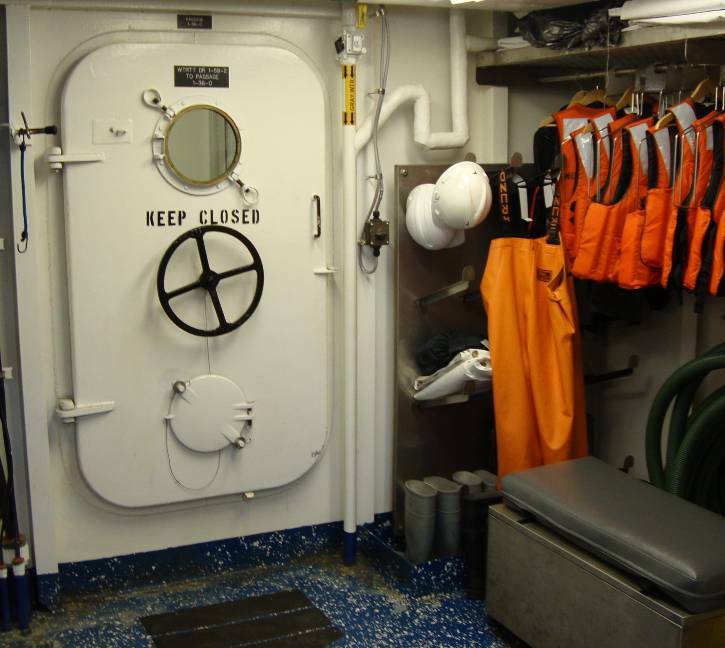 I grabbed the survival suit, strategically positioned for ready access near my bunk, and walked briskly (never run aboard ship!) to the muster station on the side deck. There, all the ship’s occupants jostled for space enough on deck to flatten out the stiff, rubbery garment and attempt to put it on. That’s much easier said than done; it was not a graceful picture. “One size fits all”, I learned, is a figment of some manufacturer’s imagination. My petite five foot four frame was engulfed, lost in the suit, while the burly six- foot-five crewman alongside me struggled to squeeze himself into the same sized suit. The outfit, affectionately known as a Gumby, is truly designed for survival, though, as neoprene gaskets seal wrists, leaving body parts covered, with only a small part of one’s face exposed. 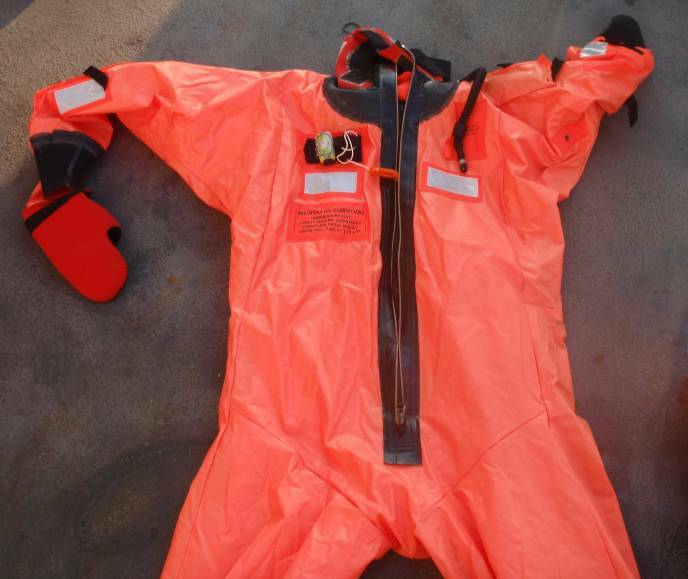 The suit serves as a flotation device, and features a flashing light, sound alarm, and other warning instruments to facilitate locating those unfortunate enough to be floating at sea. Thankfully, this was only a test run on deck. 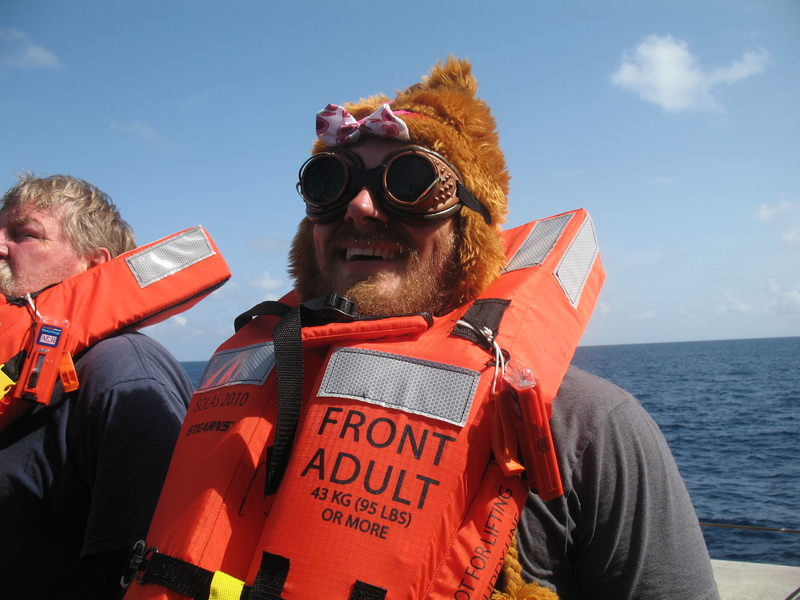 We were spared the indignity of going overboard to test our true survival skills. I took advantage of the opportunity to try a few jumping jacks and pushups while encased in my Gumby. These scientists are fun-loving and slightly superstitious, if not downright mischievous. On the last day, Chief Scientist Nate Bacheler announced a contest: whoever came closest to predicting the number of fish caught in the last set of traps would win a Pisces t-shirt that Nate promised to purchase with his personal funds. In true scientific fashion, the predictions were carefully noted and posted for all to see. 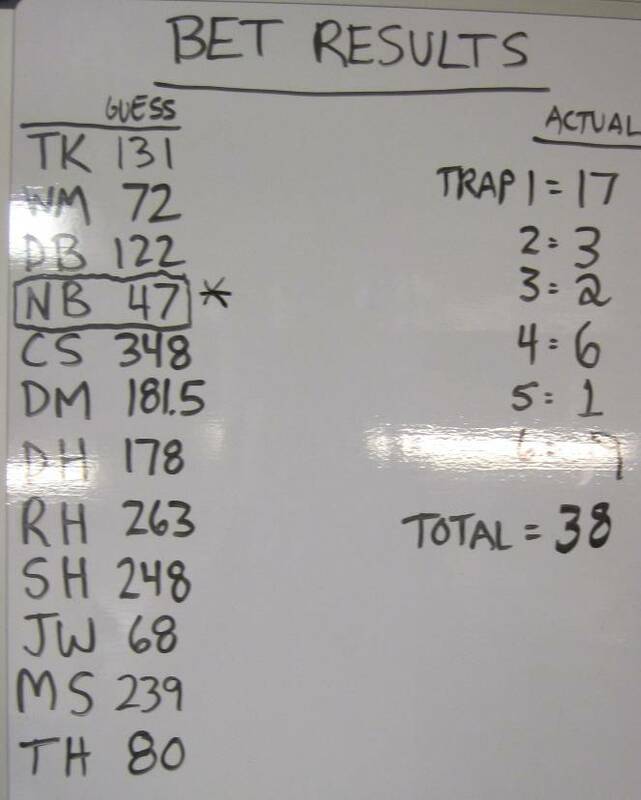 As each trap was hauled in, Nate recorded the tallies on the white board in the dry lab. Ever the optimist, basing my estimate on previous days’ tallies, I predicted a whopping number: 239. I should have been more astute and paid more attention to the fact that the day’s survey was planned for a region that featured less desirable habitats for fish than previous days. Nate, of course, having set the route, knew much more about the conditions than the rest of us did. His prediction: a measly 47 fish. Sure enough, the total tally was 38, and the winner was………Nate! Our loud protests that the contest was fixed were to no avail. He declared himself the winner. Next time, we’ll know enough to demand that the Chief Scientist remove himself from the contest. 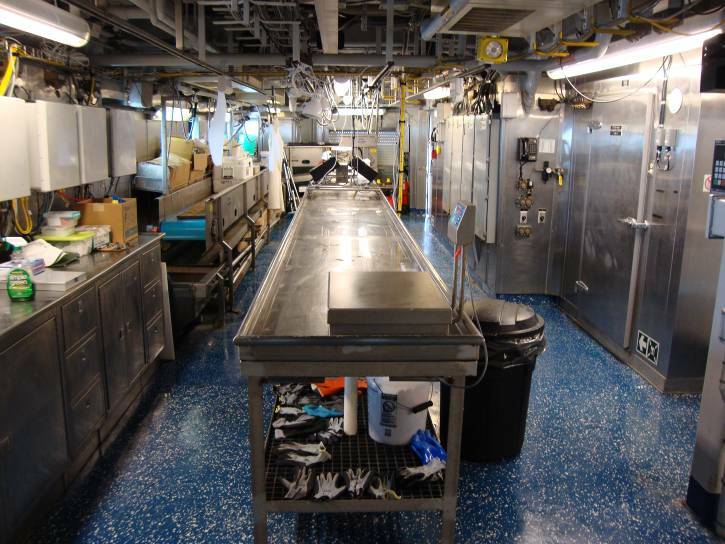 Once the day’s deck work was over, a fish call came over the ship’s public address system. 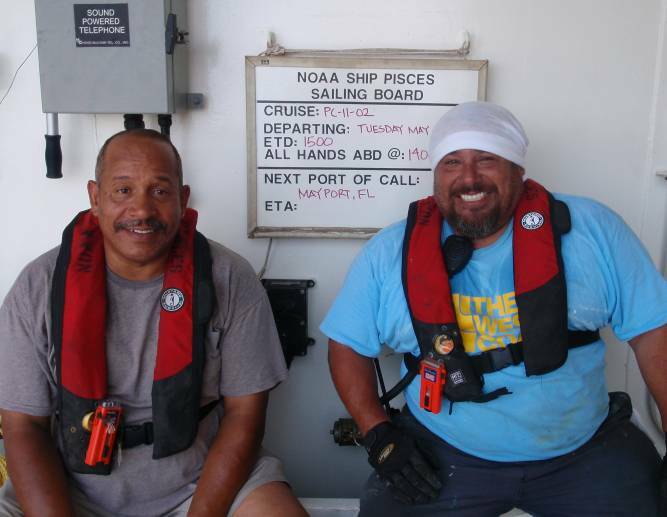 Kirk Perry, one of the avid fishermen among the crew, attached a line baited with squid from the stern guard rail and let it troll along unattended, since a fishing pole was unnecessary. Before long, someone else noticed that the line had hooked a fish. It turned out to be a beautiful mahi-mahi, with sleek, streamlined, iridescent scales in an array of rainbow colors, and quite a fighter. I learned that the mahi quickly lose their color once they are removed from the water, and turn to a pale gray-white once lifeless. If only I were a painter, I would have stopped everything to try to capture the lovely colors on canvas. We entered Mayport under early morning light. 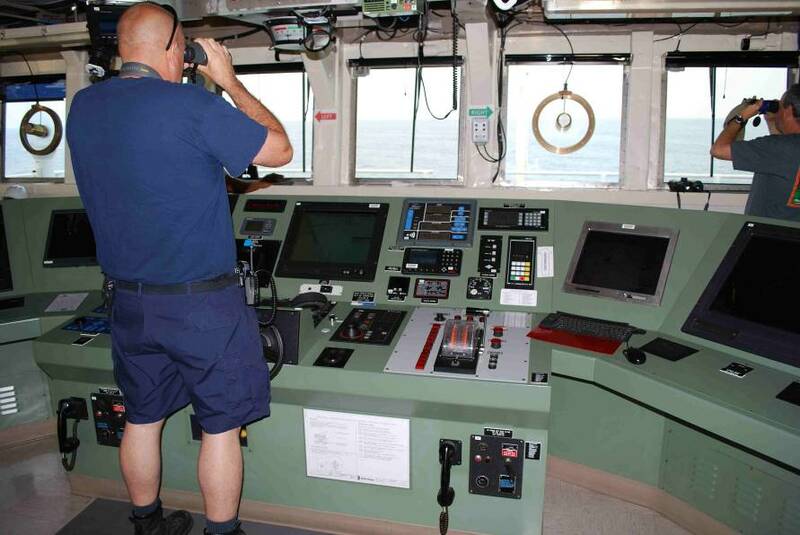 An official port pilot is required to come aboard to guide all ships into port, so the port pilot joined Commander Jeremy Adams and the rest of the officer on the bridge as we made our way through busy Mayport, home of a United States Naval base. Unfortunately, the pier space reserved for Pisces was occupied by a British naval vessel that had encountered mechanical problems and was held up for repairs, so she could not be moved. 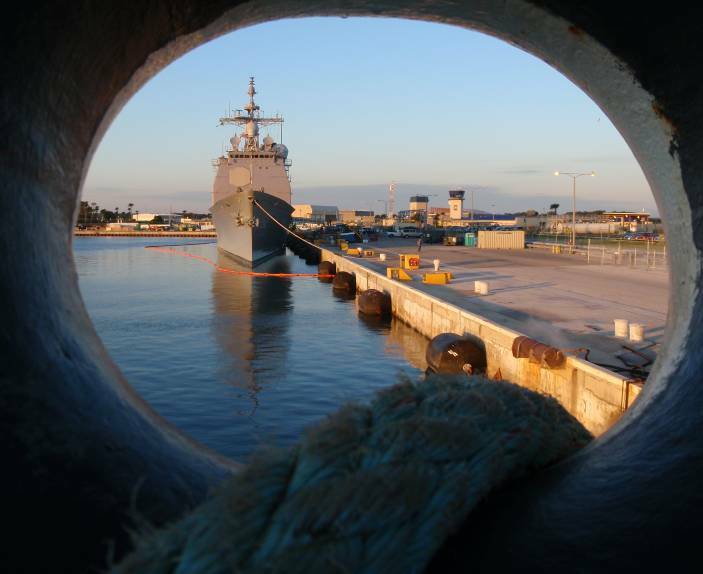 That created a logistical challenge for us, as it meant that Pisces had to tie up alongside a larger United States naval ship whose deck was higher than ours. Once again, the crew and scientists showed their true colors, as they braved the hot Florida sun, trekking most of the gear and luggage by hand over two gangplanks, across the Navy ship, onto the pier, and loading it into the waiting vehicles. 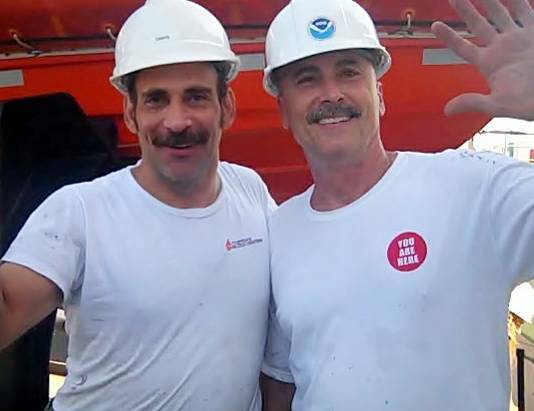 The delay gave me a chance to say farewell and thank the crew and science team for their patience and kindness during my entire time at sea. These eleven days sailed by. The Pisces crew had only a short breather of a day and a half before heading out with a new group of scientists for another research project. 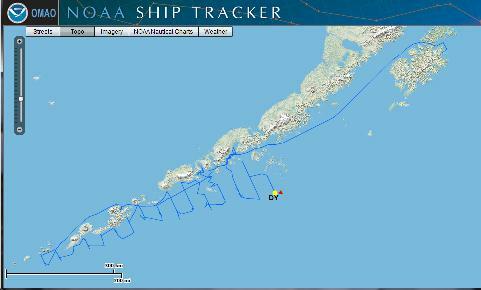 To sea again….NOAA’s work continues. 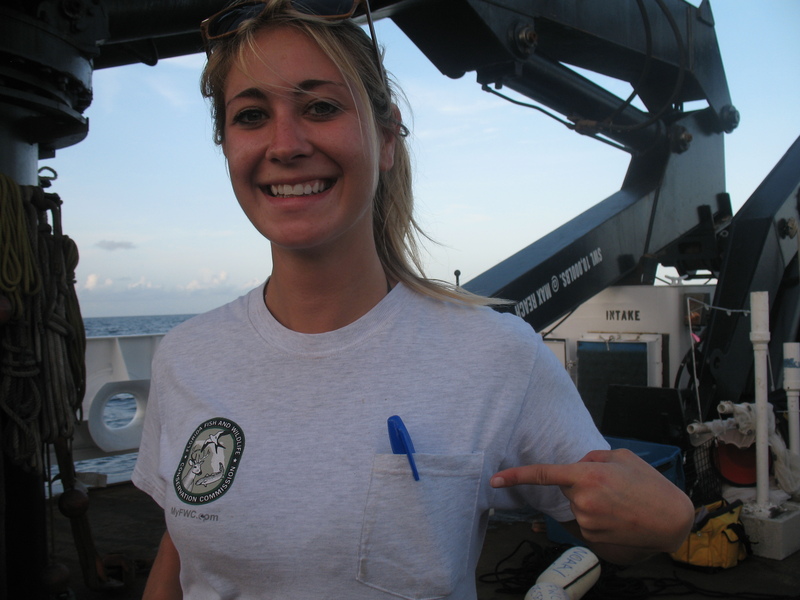 A big “Thank you!” to all the scientists and crew who made my time aboard Pisces so educational and memorable! · Pisces – ship tracker – Follow the ship’s movements. Safety! I hope I never have to use that fire axe! The first day aboard ship started with a ship orientation meeting presented by the acting executive officer (XO) LT Fionna Matheson. During the meeting the XO covered many shipboard concerns especially safety. LT Matheson suggested you always use one hand for the ship and one hand for you to avoid accidents. We also had some drills in the afternoon. LT Matheson had some really useful ways to remember the signals for drills. Fire is one long whistle, just like someone yelling fire in one long shout. The abandon ship signal is at least six short blasts then one prolonged blast, like yelling get-the-heck-off-the-ship-nooooow. 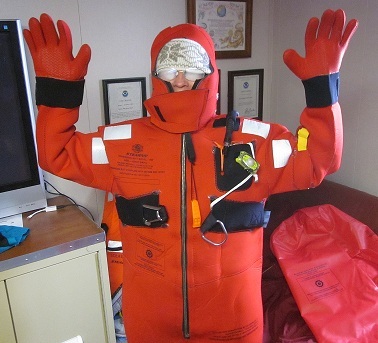 During the abandon ship drill we had to put on survival suits, called “Gumby” suits by the crew. They were hot and very awkward. We have about four days to steam to the location we will begin fishing. I am using these days to get myself adjusted to the night watch hours, midnight to noon. I am trying to tell myself it’s a good thing because I’ll be working during the cooler evening and morning hours, still hot is hot! The staterooms are quite cramped, it is a good thing I am not claustrophobic. I am still learning names of crew and the other scientists. There is a mix of NOAA volunteers, students, and professors. The food has been excellent, but I’m trying not to overindulge since there is not much activity during these first four days. The ship has a large selection of current movies loaned by the US Navy which I am taking advantage of during our downtime. Ladderwells = stairs or stairwells. Stern = back of the ship. 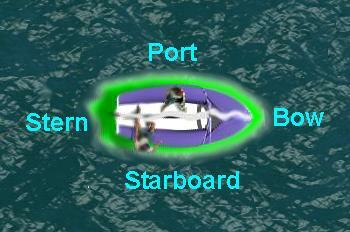 Port = left side of ship while facing bow, remember this because port is a shorter word than starboard or right, ship lights are red on this side. Starboard = right side of ship while facing bow, remember this because starboard is a longer word than port or left, ship lights are green on this side. Sea Wave: 0 – 1 ft. Swell Wave: 3 – 4 ft.
Everyone was working in full swing today. Weather balloons being released, water samples being collected, data from every possible source was being analyzed. 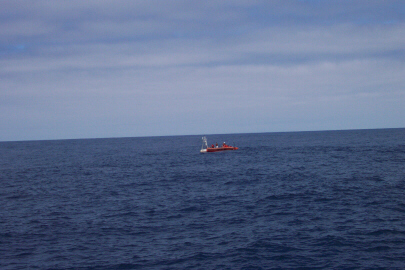 The big event of the day though, was coming upon the first buoy. A buoy is relatively small, about the size of a small monkey bar set – just big enough for one or two people to climb onto. It has a long rope with an anchor attached at the bottom so it is supposed to stay put. But many times the currents and winds are too strong and it drifts a bit, making it hard to find in the big ocean. Fortunately, it has a sensor on it that helps the ship locate it. This buoy was placed out here last year. 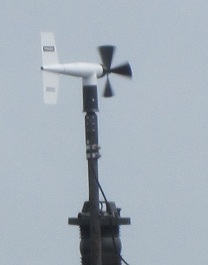 It is full of sensors that store information like temperature and salinity (how much salt is in the water) and winds. Using that information, scientists can chart even the smallest changes over long periods of time. 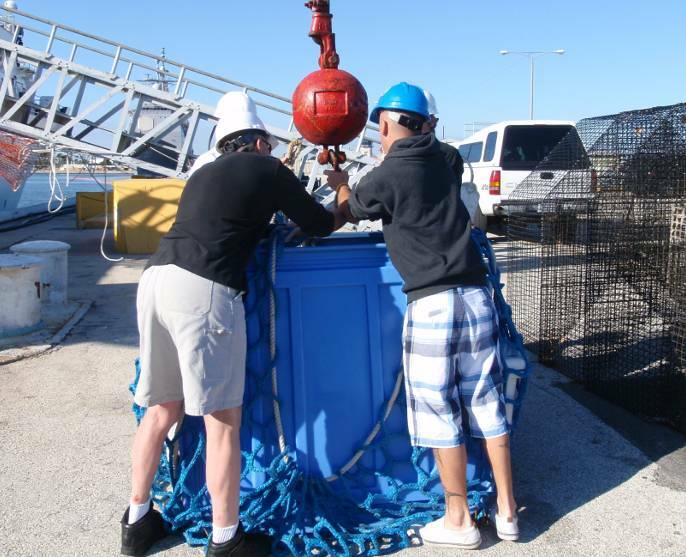 Unfortunately this buoy was damaged a while ago and stopped transmitting. Perhaps a ship ran into it or maybe a shark took a bite out it. 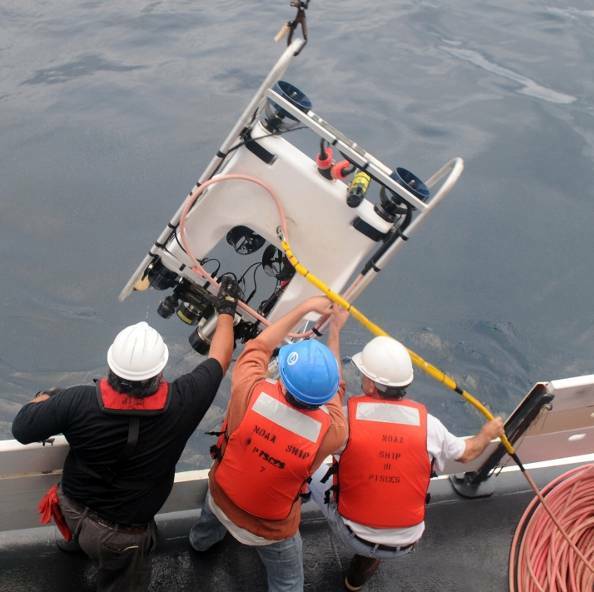 Today 2 scientists went out in a small boat (see photos) and climbed aboard the buoy and repaired it. 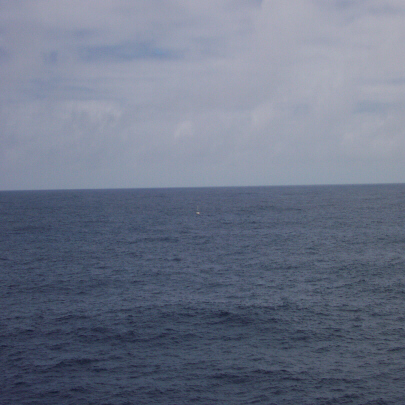 Lucky for them, the seas were very calm, but even so, it is very dangerous work. They found the buoy quite damaged probably from a collision with a ship. The buoy was fixed and is now transmitting again. 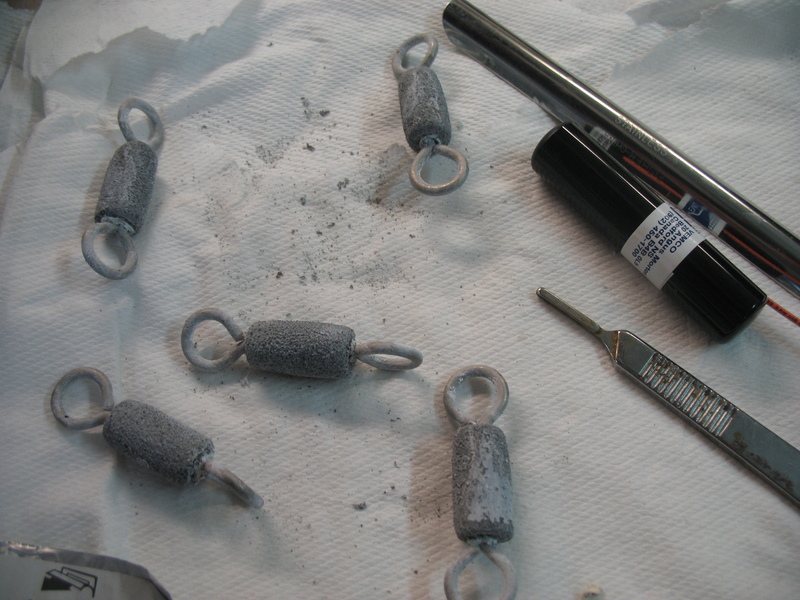 The sea was very calm, but even so, repairing a buoy is dangerous work. 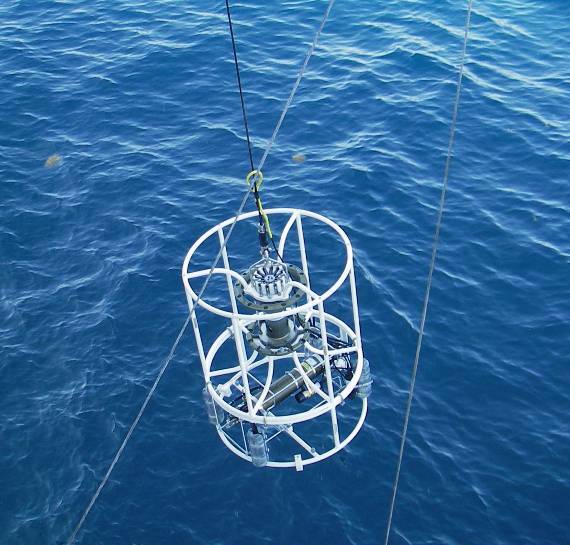 Two scientists traveled to the buoy in a small boat and climbed aboard to repair it. They found the buoy quite damaged, probably from a collision with a ship. The scientists fixed the buoy and now it is transmitting again. Repairing the buoy took about 2 hours. During that time some of the crew enjoyed fishing off the back of the boat. As Jennifer mentioned in her logs, the bottom of the buoy and the rope that leads down to the anchor act as a special habitat for sea life. Barnacles and mussels attach themselves to the rope and then small fish come to feed on them, The food chain grows quite large so that in a year’s time many big fish, including sharks, can often be seen by a buoy. Today one of the crew caught a 25 pound mahi which was deliciously grilled up for dinner. Today we also had our first emergency drills. Each person on board is responsible for knowing what to do, where to go, and what to bring for each of the three types of emergencies. The first is your basic fire drill. But since you can’t get off the ship easily, you have to know where to go to be safe. The second one is the “abandon ship” drill. This one is tough because each person must get to her room, put on a life vest, and carry a large orange duffle bag with your “gumby” suit in it down to a lifeboat. A gumby suit is a big bulky rubbery suit that will keep you warm and dry if you have to go into the water. You put it on right over your clothes and it’s really tough to do. I was told that it will be even be harder to do in the middle of a dark and cold night! 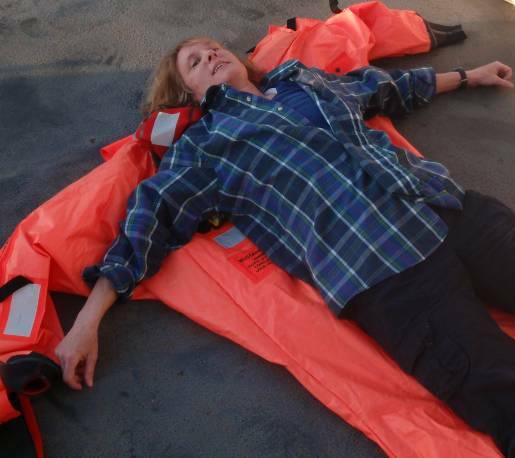 The last drill is the “man overboard” alarm. What do you do if you were to see someone fall off the ship? Three things: keep your eye on him, throw something in the water that will float like a life ring, and yell for help. 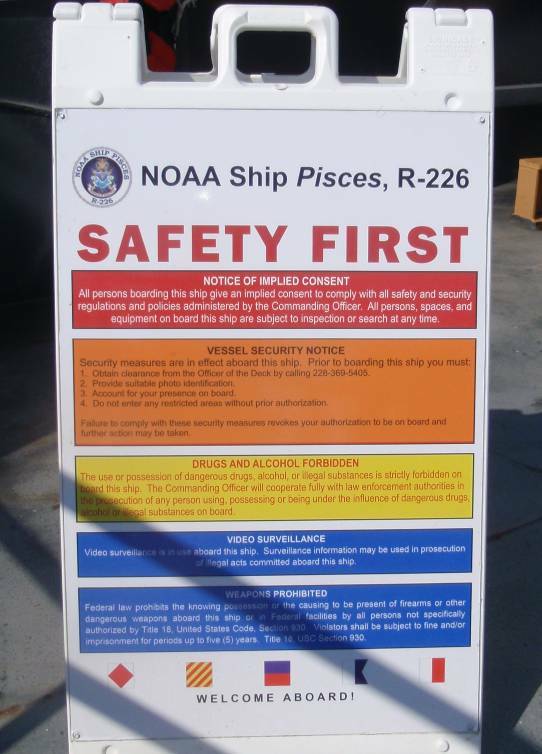 Safety is a big concern when you are on a ship. Question of the Day: How does the ship get fresh water for its passengers?